Much as we love Photoshop, it's primarily a way to edit existing artwork rather than creating art from scratch. 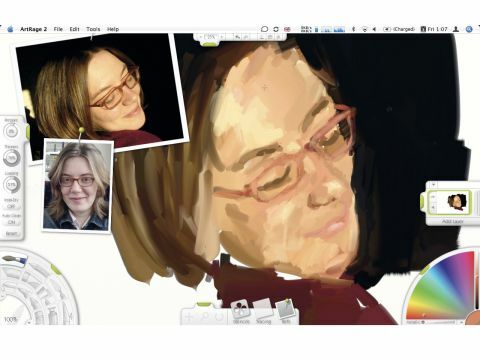 Traditionally, if you wanted to do a painting or drawing on your Mac, you turned to Corel Painter, but now there's a new kid on the block: ArtRage. Let's be clear up front: if you want the best natural media application with the widest and most realistic range of media, Painter is still, without a doubt, the only choice. Its paints, pencils, chalks and the rest behave in a way that almost perfectly mimic their real-world counterparts, and it has the grunt and the pedigree to deliver outstanding results. If you can't afford Painter, ArtRage gets the strongest recommendation we can give it for two reasons. First, it's just plain fun. As we'll see, much of its interface is geared towards making the act of creating artwork easy and accessible, and while its bubbly, my-first-painting-app styling might occasionally grate, it generally doesn't get in the way, and helps make the process seem less daunting. The second reason is the price. At around £12 (accounting for exchange rate fluctuations) it's one of the very best value software titles ever produced. If you pick up a copy of Painter on Amazon, it will cost you £222; put another way, buy ArtRage and get Painter (sort of) with 95% off. While Painter's range and richness of media trounces those in ArtRage, it still does a pretty decent job. The default medium is oil paints, and paint strokes do interact in quite convincing ways. You can use intuitive dials to control the amount of thinners used, how much paint is loaded onto the brush, whether the brush is automatically cleaned, or whether paints remain wet or 'Insta-Dry', turning oils into something like acrylics. You also get a pencil, palette knife, chalk pastels, paint roller, crayons, water-based felt tips, impasto-style paint tubes and - tacit acknowledgement that we're not creating high art here - glitter. All can interact with each other and with the configurable painting surface to varying degrees, though you can use layers - plus Photoshop-style blend modes - to separate elements. Layers can be grouped and manipulated, and there's good support for layered Photoshop files on import and export. Picking colours is done from a palette at the bottom-right of the screen, and it can show various colour modes as well as snipping out an area of a picture or classic painting to use as a colour source. Again, it's not a patch on Painter's palette with which you can push paint around, but it's still good. A tap on [Tab], and all the palettes drop off the edges of the screen to let you concentrate on your picture. You can import images for tracing - optionally picking up the colours automatically from the source - and import and manipulate reference images that now get saved with the painting file. New to 2.5 are stencils and rulers, and while comic-style pows and zaps are perhaps a little limited in appeal, a set of French curves could come in handy, and you can define your own stencils. Also new is proper support for printed resolution - create a canvas to a specific size at, say, 300dpi - though the app's occasionally sluggish performance means that those on low-end or older Macs should keep resolutions low. The results are quite good, but if you have no existing skills with a paintbrush, or lack understanding of some basic painterly techniques, don't expect to be churning out masterpieces. It can be slow, particularly when opening and saving, and the media don't look and behave as naturally as Painter's, but at a little over a tenner, we don't have any real reasons not to buy it. A graphics tablet is effectively essential, but even factoring in the cost of, say, Wacom's Bamboo A6 tablet (£68), you'll have a cracking digital studio.